1. 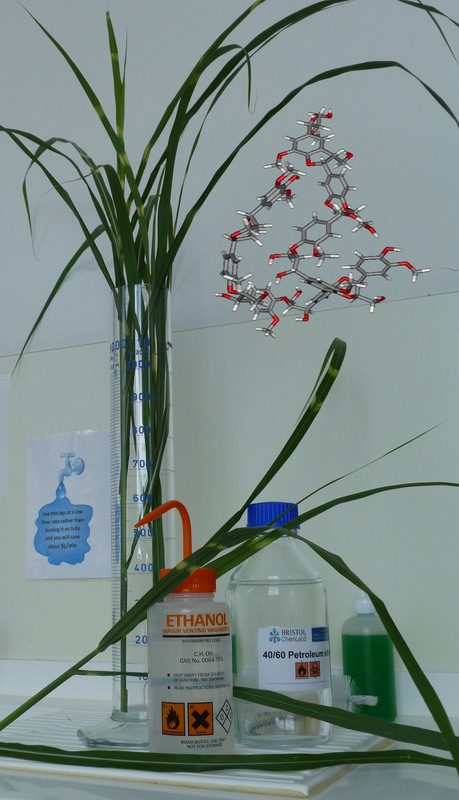 This picture shows some leaves of the perennial zebra grass Miscanthus sinensis ‘Zebrinus’ in a measuring cylinder on the draining board of a laboratory sink, a small model of a section of lignin polymer, as well as a wash bottle of ethanol and a small bottle of petroleum ether, distilled to have a boiling point between 40 and 60 degrees Celsius. The zebra grass is standing in for one of its cousins, Miscanthus x giganteus, which is starting to be used as a source of renewable energy crop. This grass is quite efficient at converting solar energy into new plant material and can be grown on land which is not suitable for edible crops. At the end of the growing season, the stems and leaves can be cut down, dried and then used to burn in boilers for heat generation. Alternatively, it is hoped that the lignin of the stems can be converted into biofuels, including ethanol and butanol, which could be used to replace fossil fuels. While using agricultural land to grow crops for fuel is very controversial, plants which will grow in less favourable conditions and require little or no watering, fertilisers or weed- and pestkillers are possible alternatives, and Miscanthus is already being used for small-scale heating. Chemically breaking up the lignin polymers to make useful fuels is more difficult and remains an area of active research, because it would allow us to use many different plant materials, including waste wood and stalks, to produce liquid biofuels. These could simply replace fossil fuels without requiring a different distribution network or changes to the design of car engines. However, this is only worth doing if the energy needed to convert lignin into more useful molecules is less than what you can gain from burning the products in a combustion engine. 2. One way of carrying out reactions that would normally need a lot of energy is to use a catalyst. The most general definition of a catalyst is that it is a compound which takes part in a chemical reaction and so provides a different reaction pathway needing less energy. The catalyst itself remains unchanged by the reaction. This means it can be used many times without being used up, although most catalysts eventually become poisoned by other reactions and need to be replaced. For some chemical reaction, there are several bonds in a molecule which could react, and in those cases the right choice of catalyst can also be used to favour a reaction at one specific site, making the reaction selective for just one of many products. If you want to break up lignin in a way that will only give you ethanol, rather than other alcohols, there might be a catalyst that can make this reaction energy efficient and also selective. Alternatively, if you already have ethanol, for example from fermentation, it might be possible to upgrade it to other alcohols, which make better biofuels. Finding the best catalyst for each job can take a long time and usually involves trying out different systems in model experiments. Over the last few years, calculations have also been used to help with finding catalysts. It is actually difficult to work out the exact molecular structure of lignin, as it is a polymer made up of a range of different monomeric building blocks, and the number and order of these monolignols varies from plant to plant. The molecular structure of lignin shown in the pictures here is one possible sequence, but there are many others. Although we may not know exactly what polymers of lignin look like at the molecular level, we do know what kind of building blocks are present and this is sufficient to start looking for catalysts which will target specific bonds in the polymer and could be used to convert it into more useful, smaller units. 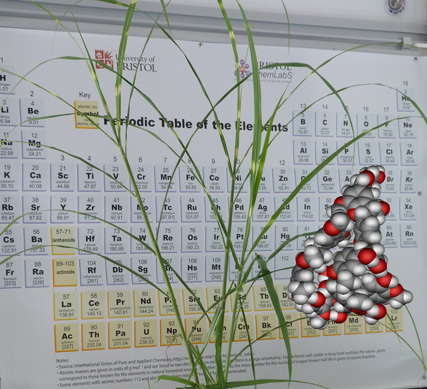 Miscanthus in front of the Periodic Table; also showing a model of lignin. 3. Lignin depolymerisation is an active area of research as it might enable industry to access lignocellulosic biofuels from wood and vegetative waste, reducing the potential competition between edible crops and fuel crops in the future. One of the key targets is to break up the beta-O-4 ether linkages in lignin. A ruthenium catalysed depolymerisation reaction has been developed (J. Am. Chem. Soc. 2010, 132, 12554-12555) which dehydrogenates an OH group and then activates an adjacent C-O bond. The reaction has been successful on both a small model of the ether (2-aryloxy-1-arylethanol) and its polymer. 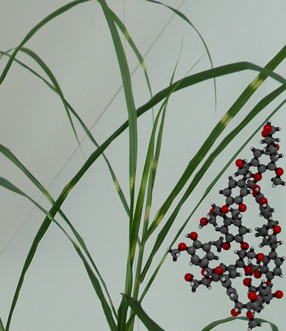 Computational studies of the molecular structure of lignin and its interactions with cellulose are complicated by the size of the polymer and the lack of detailed structural information, as well as the conformational flexibility of the system. The latter can be addressed by conformational searches and molecular dynamics studies, both of which are computationally demanding, limiting calculations to low levels of theory. Force field parameters for lignin have recently been reported (J. Comput. Chem. 2008, 30, 457-467) and QM/MM studies might be feasible as well (see Env. Progr. Sust. Energy 2012, 31, 47-54 for a short review). In addition, some DFT studies of linkers and model compounds have been reported (J. Phys. Chem. Lett. 2011, 2, 2660-2666, ChemPhysChem 2011, 12, 3556-3565). Contributors: Natalie Fey (images, text), Simon Perks (photography). Categories: Fuel, Plants | Tags: biomass, catalysis, chemistry, fuel, miscanthus, polymer, science | Permalink.